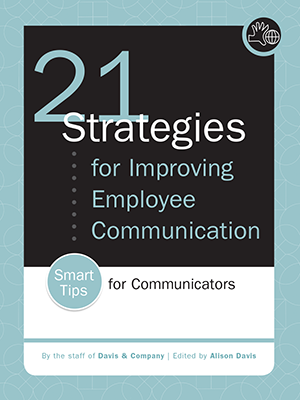 This employee communication how-to guide offers 21 smart, time-saving strategies to make your job easier and make your communication more effective. How can you communicate more effectively with employees? Your communication challenges arrive daily at your desk in all shapes and sizes. This straightforward book from employee communication experts at Davis & Company provides fresh strategies to help you solve your communication challenges, large and small, and get measurable results. Each strategy has been adapted from the archives of our acclaimed electronic newsletter, Smart Tips. These 21 compelling ideas—complete with how-tos, examples and common mistakes to avoid—will ensure your success in reaching your employees and getting your messages through.